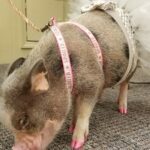 USB decided to add a little “fun” in their fundraiser for Relay for Life with Kiss the Pig. The challenge amongst the branches was to raise the most money and the most tenured employee at that branch would kiss a pig. It was a surprise until our staff meeting of who was the lucky person. 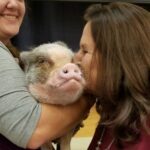 It so happened that it was such a close race between Elkton and Main branches, an employee gave the difference to see both ladies kiss Frankie the Pig. Both Sandy Scott, Internal Loan Review, and Jane Boley, Chief Operations Officer, very happily kissed Frankie in Memory of employees who have lost their fight to Cancer. USB’s President & CEO, Billy Bingham joined in the fun and kissed Frankie too. The total raised was $1000 for Relay for Life!! Frankie is from Pig Pen Hill in Cadiz. Her mommy, Stacey Davenport has trained her to do several tricks and had her all glammed up. Everyone enjoyed Frankie’s visit, she rocked the house!